We're all familiar with the standard circular color wheel, showing the primary colors of red, yellow and blue, and their relationships to a number of other colors. Color wheels have been tools of scientific examination since the days of Sir Issac Newton who used prisms to split white light from the sun into a continuous spectrum of colors. What I did for today's Art Every Day for the Month challenge is more of a color mixing chart than a color wheel. 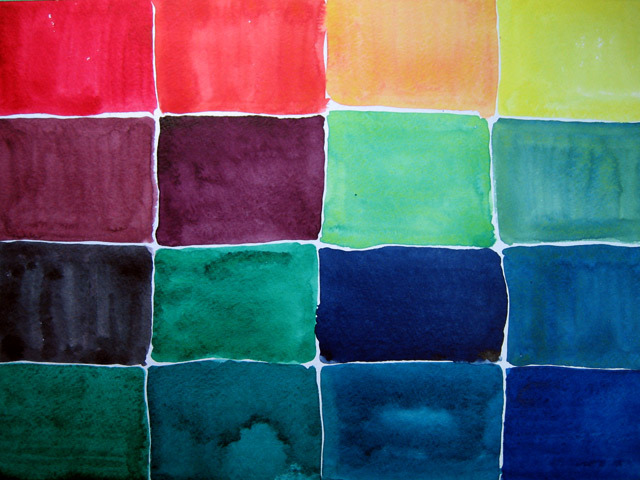 I arranged four base colors, alizarin crimson, lemon yellow, viridian, and prussian blue, into the four corners of the rectangle. The two blocks in between each pair of base colors show the colors mixed from those pairs, across the top, bottom, sides and diagonally through the center of the rectangle. If I had paid a bit more attention while I was working, I might have mixed up enough fluid colors to paint flat washes on each of the 16 blocks. I might also have been a bit more precise about the proportions of base colors I used, and even paid some attention to the tinting strength of the base colors, too. Lessons learned for next time. But even this simple mixing chart demonstrates the intermediary relationships between these four base colors, and that's what I was hoping it would do. Good practical experience. These kinds of color charts are extremely helpful as you have stated here. I love the amazing amounts of colors that are possible from so few starting colors. I bet you are learning a lot this month about watercolor.